From a goalkeeping perspective, Arsenal began the 2014/15 campaign with the sale of Lukasz Fabianski to Swansea. He made 78 appearances in the course of seven seasons for the Gunners and when he realized that he couldn’t usurp his compatriot, Wojciech Szczesny, a move away seemed like a plausible move. The Gunners replaced the departed goalie with Colombian shot stopper, David Ospina, that had a good World Cup by his fair standards. As the season progressed, injuries paved the way for young Emiliano Martinez to get a run out. Gooner Daily analyses the performances of the three goalies. With Fabianski gone, Szczesny was the undisputed No. 1 for Arsenal at the start of the season and he kept his first set of clean sheets in the Champions League playoff fixtures against Besiktas. Despite winning the Premier League Golden Glove in the previous season, Szczesny had to wait till late October to keep his first clean sheet in the Premier League when the Gunners visited Sunderland. Earlier in the campaign, his rash challenge on Burak Yilmaz earned him a red card which made David Ospina have his official debut for the club. 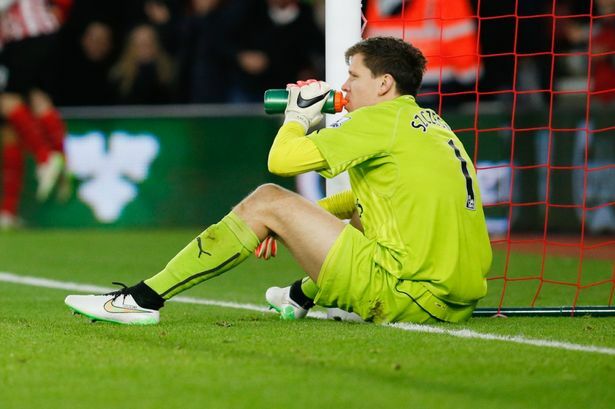 Szczesny will not remember this season fondly, especially after his horror show against Southampton on New Year’s day. The goalie endured a horror outing at St. Mary’s and was caught smoking in the dressing room after the game which obviously incensed his manager and ultimately cost him his place in the first team. With Ospina featuring consistently in the Premier League, Szczesny became the ‘Cup keeper’ and started in Arsenal’s FA Cup wins over Brighton, Middlesbrough, Manchester United and Reading. He’s odds on to start in the FA Cup final against Aston Villa this weekend and I hope he puts up a better performance than the one he put up in the semis. Young Emiliano Martinez joined the Gunners in 2010 but after featuring consistently from the Reserves, he got his big break this season when injuries to Szczesny and Ospina paved the way for him. He made his Arsenal debut in the Champions League win over Anderlecht and featured in the Premier League for the first time when Szczesny clashed with Kieran Gibbs in the home defeat to Manchester United. With Szczesny set to be sidelined for a couple of weeks with Ospina still nursing an injury, Martinez was to have an extended run out in Arsenal’s goal. So much was made about him in the buildup to Arsenal’s clash with Dortmund but the young Argentinian but up a virtuoso performance against Juergen Klopp’s men, keeping a clean sheet in the process. He went on to keep consecutive clean sheets against West Brom and Southampton before struggling in the away defeat to Stoke. That turned out to be his last appearance for the team before he was farmed out on loan to Rotherham United. A good breakthrough season for the young lad. Featuring in a World Cup will always put you under the spotlight and while James Rodriguez set the stage on fire with his breathtaking performances, a certain David Ospina looked very assured at the back till their quarterfinal loss to Brazil. He had made 196 appearances in six seasons for OGC Nice and when I heard that he was coming to Arsenal, I was hoping that he’d be a better competition to Szczesny as the likes of Manuel Almunia, Vito Mannone and Lukasz Fabianski had all fallen on the road side when challenging the big Pole. Ospina had injury problems to contend with and was given enough time to heal his wounds. Following Szczesny’s dismal night at Southampton, Wenger promoted Ospina to the first team and he never looked back. Three clean sheets in his first four games was helpful to his course then the fans came up with a brilliant chant that should inspire the goalie. Anytime the Colombian wants to punt a dead ball, the Gooners scream his name which was a reminder of how fans can make players settle quickly. Some say playing with a balanced back four helped his cause but since Ospina took over from Szczesny, he has been very assured and the defenders trust him. It’s going to be interesting to see how their battle for first team places intensifies next season. I’d discuss about the defender’s performances tomorrow. Posted on May 26, 2015, in Arsenal, Football, Premier League and tagged Arsenal, David Ospina, Emiliano Martinez, Football, Premier League, Wojciech Szczesny. Bookmark the permalink. 5 Comments. Quite an addition to the side, Ospina. He brought with him a huge deal of confidence that assured the team members alike. He pretty much calmed everyones’ nerves as against the usual schoolboy blunders that epitomised Szczesny’s performances. His performance at the World Cup was awesome like you rightly pointed. Hopefully he’ll help the team to really challenge for the title next season. And if the noise about Cech is anything near actualisation, then the tussle for the number 1 shirt will be a sight to behold. Keep gunning! I don’t see us having Ospina, Cech and Szczesny at the same time. Rating Martinez higher than Szczesny looks like a crime.